Basically, wah pedals got their name after the type of sound they produce – it literally appears as if someone was yelling “wah-wah”, hence the name. Now, it’s safe to assume that the vast majority of guitarists have heard about these pedals, but there are still a lot of people who don’t know how wah pedals work, what’s their contribution to the sound, and stuff like that. We’re here to demystify these issues – you’ll find answers to most (if not all) of your questions regarding the wah pedals and effects in the “buying guide” sections below, after which we’ll treat you to several top models which all bear the label of “best wah pedal” for one reason or another. HOW TO CHOOSE THE RIGHT WAH PEDAL? 1. HOW DOES A WAH PEDAL WORK? 2. ANY DIFFERENCES BETWEEN WAH PEDALS? 3. HOW TO USE WAH PEDAL? Assuming you are completely new to wah pedals, you shouldn’t skip this part. This section is dedicated to explaining all the technical details about wah pedals which will help you make your final decision more easily. Wah pedals are practically “distorting” the sound of your guitar. Using this pedal, the vibrations from your guitar will be translated to actual tones, but right before they emerge from the amp, they’ll shift in pitch, leaving the “wah wah” effect. In essence, the wah pedal serves to alter the guitar’s tone signal. Basically, the basses (lows) of your guitar are moving up to medium heights, resembling the effect you’d get by cranking up the treble knob, but that’s just the beginning of it. A wah-wah pedal alters the frequencies produced by guitar’s signal, sweeping the so-called “peak response” of the frequency filter in the direction you’re pressing onto the pedal (up or down). Simply put, using a wah pedal will, in most cases, grant you the opportunity to play around with the sound – people who are getting inferior sound either have a low-quality pedal, have placed it in the wrong spot in the chain, or experience some other pedal chain problems. So what are the factors that we need to take into consideration before we even begin to elaborate on how wah pedals affect the sound? One of the most important factors is the technology used to manufacture the pedal. There’s a plethora of brands, and each team of experts employ different technologies – some brands like classic Dunlop and Vox rely on heavy digital hardware to make the wah’s a bit more modern in sound, older reputable brands are sticking to their guns and polish the old-school “crybaby” wail, and of course, there are brands who use both old and new technologies in a more innovative way (a good example of such a pedal is Xotic Effects Wah pedal which features Bias, bass and treble control atop the adjustable torsion). That being said, each wah pedal will definitely affect the tone of your guitar, regardless of how good or bad it is. Trying out several pedals and doing a comparison will let you decide which one suits your needs, but another way of finding that out is to check out our reviews – we’ve picked out nothing but the best for you, so make sure to not skip out on our top picks. Comparing simple wah pedals to flexible ones is possible, though it appears unnecessary. 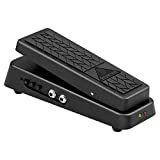 Simple wah pedals are meant for beginners to understand how the basics of wah effect work, or for musicians who do not want to alter their guitar sound in a major way. It’s safe to say that every guitarist could benefit from a flexible wah pedal. Most flexible wah effect pedals come with a wide variety of features, such as volume control, frequency control, equalizer settings, and such. Now, it’s only normal that people who don’t want to mess around with a huge outfit of controls prefer simple wah pedals, but that’s not the only reason – flexible wah pedals are often more expensive. In essence, both optical and mechanical wah’s do the same thing, only by a different method. Mechanical wah pedals feature gears and potentiometers which respond to the physical shift of the pedal (up or down). Once the motion is performed, the signals are transferred to the main control unit and later to the amp, resulting in the “wah” sound. The entire process happens in the matter of nano seconds, so the difference in speed when we compare optical and mechanical wah pedals is barely noticeable. Optical wah effect pedals employ the use of lasers rather than potentiometers, but they do basically the same thing. The only real difference, though, is that optical wah pedals are more reliable. Namely, pots and gears can rust, oxidize, or wear off with time while lasers simply won’t. As it’s only obvious, higher-end models are quite superior to entry-level wah effect pedals. Even though exceptions are possible, we shouldn’t venture so far as to establish a rule from it. Some of the most notable differences between the wah pedals throughout the price point category regard the sound, features, and durability. The difference in sound can be characterized as the quality of tone alteration. Budget-level wah pedals will give you a blunt, plastic sound while high-end models will blend in with the rest of the chained effects better, providing a more natural sounding wah effect. As for the features, it’s logical that more expensive models will allow you to benefit from a wide array of settings. While budget models are almost exclusively simple wah pedals, high-end models are, more often than not, outfitted with an abundant set of top-shelf features. Most beginner guitarists think that using a wah pedal involves “pressing the pedal up and down when needed”. That’s one way to put it, and even though it’s not wrong, it certainly isn’t a sure way a wah pedal should be used. You need to know its place in the signal chain, and how to properly use it during solo sequences. Which music styles are you playing? It’s true that there are wah effect pedals which are labelled as “versatile”, as in “suitable for most music genres”, but if you really want to get the most from your sound, you should pick a model that was designed for your playstyle. Those who prefer “heavier” music styles are, perhaps, also the ones who rely on wah pedals more than others. Rock and metal music are often laden with sweet, maybe a bit technical solos, so a wah pedal is not only necessary, but warmly recommended. Apart from that, rock and metal guitarists shouldn’t settle for “any” wah pedal, rather they should leave out the budget options and consider medium-priced, if not even high-end wah pedals, as their sound will gladly welcome the boost. Though most people perceive Jazz and Blues as “mellow”, these music styles are brimming with emotion all the way. If you’re playing one of the aforementioned genres, you’re probably already using a very specific rig – a smooth delay, a compressor, maybe even a bit of crunch on top. Even though you might be satisfied with your sound, every jazzer/blueser needs a wah pedal, as those solo sections and passages simply can’t come out and feel as expressed without a wah pedal. Funky music sub-genres often employ all kinds of sound altering effects, and wah’s just one of them. Just like with blues, you could get what you want from your sound even if you skipped wah, but think of the benefits – old-school groovy funk is virtually impossible to imagine without this addition. Punk and punk rock music sub-genres are pretty straightforward – the crunchy distortion expresses the plain, semi-heavy riffs, the bass is straight, and the rhythm section simply keeps the party going. Though there are punk guitarists who play a solo every now and then, this music can survive without a wah pedal. Since people “invent” new music genres every day, let’s talk a bit about the “alternative” music genres and do they demand a wah effect pedal. These “sub-genres” have so very little in common that there’s no other way to categorize them apart from calling them “alternative” (pop music excluded, as it goes without saying that most pop artists don’t really need a wah pedal). Mellower genres (often acoustic ones) could do without a wah pedal, fast-paced upbeat music often needs to be precise, so signal alteration isn’t exactly recommended (not to mention that you don’t want to overburden your chain), while solo-heavy sub-genres (all sorts of “hair” rock and metal, stoner, and such) simply demand this effect. Where should we put wah pedal? Wah pedals are exclusively placed at the very beginning of the signal chain – they come right after Dynamics (compressors and such), but come before pitch shifting guitar pedals and other volume effect pedals. The reason for that is quite simple – wah pedals affect the sound in a drastic way, but more importantly, these pedals wouldn’t be so pronounced and effective if they weren’t synergic with the other guitar effects (modulation effects, time-based effects, and volume-effects). How to use wah when playing? The situations in which you can use a wah pedal efficiently are virtually limitless. You can use it to juice up certain parts while playing the rhythm guitar (preferably between passages to accentuate the dynamics) or make your solos sound even more exquisite. Let’s break it down a bit. Wah pedals are more frequently used during solo passages, as the bonus versatility makes the much-needed difference in tone. To get the best from your wah during solos, get a flexible wah pedal, tweak around with the control knobs until you’ve got the effect you need. Depending on your preferred play style and type of music, this could be mildly altered sound to pitch-shifting dives. As for the rhythm sections, you shouldn’t abuse the wah effect. Use it mildly and always think about what you intend to achieve. If the passage is already filled with numerous notes, harmonies, and such, maybe the wah effect isn’t so necessary. On the other hand, flat parts which are basic in nature could be spiced up with some moderate wah. One of the most frequently used wah-pedal technique is the accentuation of the note. Since you’re in control of how strongly the signal can be altered (thus the sound as well), you can accentuate the note, or even a whole riff by gradually applying some wah (by pressing on the pedal). On the opposite end is a variation of the “fade out” – while the riff (or a note) is in full swing, lean on the wah downward to mute it out. Additionally, by swiftly pressing up and down on the pedal, you could get a fuzzy “wah-wah” effect after which the pedal got the name. The speed of the sweeping is important, but you should be able to determine it in each song by splitting the tempo in fours, sixes, or eights (depending on the time signature) – simply alter between pressing and pulling as you count. Decay – The decay adjusts and tweaks with the time over which the wah’s alter the frequencies. The lower the decay, the higher the interval between sound alterations. Volume knobs – Most optical wah pedals feature but a few tweak knobs, most commonly volume knobs. These might not even be marked or named, but they act as a volume boost in a sense. Let’s open up with Dunlop’s GCB95 CryBaby. This wah pedal is moderately priced, meaning that it doesn’t cost a fortune, but it’s also not the cheapest effect pedal out there. What’s more, it’s decently versatile and durable. First things first, the GCB95 features a sturdy die-cast construction that provides a superb level of durability. Furthermore, the patented HotPotz potentiometer ensures a high-quality, abrupt sound which is fairly distinguishable from other wah pedals. If you’re asking what music styles it would suit the best, it’s tough to give a one-sided answer. Namely, it’s used by rock and metal musicians, but jazz & blues guitarists seem to like it a great deal due to its phenomenal reliability. One of the most notable benefits of this wah pedal, also the thing that sets it apart from the similarly priced wah pedals, is that it can withstand years of usage without losing the much-needed edge. Overall, it does a major bang for the buck and we highly recommend it. The Hellbabe is the first optical wah pedal in our review – it’s decently cheap, it sounds awesome, and it’s pretty versatile for the buck. The brand labels it as “multi-functional wah pedal”, leading us to the conclusion that it’s to be used in virtually all sorts of music genres. Behringer is pretty famous for making top-quality products, and Hellbabe is an exceptional representative of what they can do when they put their minds to it. What speaks volumes about HB01’s durability is the wear-free optical control – even though the casing isn’t impervious to damage, there are no mechanical potentiometers which would wear off given enough time. As for the sound, this particular model will give you whatever you wish for – the initial sound presets and options aren’t exactly exemplary, but you’ll be able to customize your sound however you see fit. This also contributes and provides further argumentation we stated before regarding that the Hellbabe can provide the sound for guitarists of all trades and crafts – beginner or veteran, metalhead or jazzer. The reason why Vox describes the V845 as a “classic wah pedal” is because it follows the exact specifications of original Vox pedals made back in early ‘60s. Now, it does look a bit modern, given that it’s an optical wah pedal, but the sound it offers is remarkably exquisite, reminiscent to that of an old-school crybaby wah. What’s more, the good folks of Vox have gone an extra mile when they improved the housing. The casing features lightweight die-cast materials which can withstand quite a punishment and abuse. This pedal is outfitted with a power-saving AC connector which preserves the battery lifetime, allowing for extended usage. Lastly, Vox V845 is pretty affordable. Of course, it might not be the cheapest pedal you’ll ever get to use, but it doesn’t cost much. Since the sound V845 makes is characterized with classy wah “cries”, it’s sadly not as versatile as some pedals we’ve reviewed so far. It should be used for traditional music genres like rock, heavy metal, oldie pop, and generally music styles that don’t require modern sound (electronic music, before all else). Dimebag, being one of the most influential metal guitarists of all time, used a very specific set of accessories and gadgets, and we’re reviewing his signature CryBaby from hell. Now, this isn’t a replica of Dime’s actual Wah pedal, rather it’s made with the same (or extremely similar) set of features. If you are looking for a metal wah effect pedal, you’re going to love this one, but it could work for guitarists who prefer other heavy genres (punk, hard rock, other sub-genres of metal). First of all, Dunlop’s Dimebag Crybaby from hell provides an extended range of tone shifting potential when compared to regular wah pedals. You’ll be able to reach new heights and drop deeper down. It sounds very unique, but what makes it so special is its versatility. Namely, you can use the kick-in boost to further augment the volume of your wah between the range of nil and seventeen decibels. Other switchable settings feature the Q control regarding the frequency breadth, and the fine-tuning knob which controls the down-sweep range. Additionally, there’s a set of LED-lit indicators which will let you know about status changes, making it particularly useful when playing live on a darkened stage. The only problem people seem to have with the Crybaby from hell is that it costs nearly twice as much as a quality wah pedal. Even though it lacks in affordability, it holds a considerable value for the buck. Many musicians have labelled Petrucci as one of the “biggest virtuoso guitarists of all time”, and rightly so. He’s practically responsible for the huge success of his Dream Theater, and it’s safe to assume that millions of young guitarists want to know how he got that particular sound. It’s partly because of a massive rig collection, partly because of his unmatched guitar skills, but his wah pedal had a take in it as well, which leads us to Jim Dunlop’s JP95. Even though Petrucci used (and changed) quite a lot of effect pedals, this model is labelled as his “signature wah pedal” because it features a synthesis of all notable wah effects he most frequently used. The first thing you’ll notice is JP95’s authentic design. It looks downright plain, but the tiny details make it look exceptionally exquisite and rather breath-taking. What’s more, the chrome finish makes it even more appealing, but let’s not get carried away – this wah pedal has more to show off than just looks. There are two LED-lit lights on each side which display the status (on or off). This is a very plain feature, but it helps a lot – guitarists who have several pedals in their chain know what troubles can brew up when they have doubts whether a pedal is working or not. There’s a total of six equalizer controls, as well as the volume knob for you to play around with the sound. While we’re at it, you can rest assured that you will be able to nail the exact wah effect Petrucci uses. Just like Dimebag’s Crybaby from hell, Jim Dunlop’s JP95 is a bit pricey. That, however, is its only downfall, otherwise it does a major bang for the buck and every guitarist worth his salt should eventually own this pedal. Some of the best wah pedal models are the ones that are the easiest to find – take any “signature” model and you’ll get the point. These pedals are very easy to understand after a couple of runs, but don’t get your spirit down if you mix something up in the very beginning. Picking the best wah pedal from the ones we’ve reviewed is a very tough call since each and every model excels in this or that. However, our victor is Jim Dunlop’s JP95 (John Petrucci Signature). It simply provides a better sounding, more sustained wah, it’s very easy to use it, and it doesn’t cost a fortune to top it all. Make sure to check out our buying guide to get as much details as possible on how to use a wah pedal, and check out our reviews of the best wah pedal models in the sections above.